I have burnt eight big bags, builders bags, of wood, to heat my cottage since a week or so before Christmas. I switched off my night storage heater system and have only just turned it on again, as I have run out of wood! Apparently, one of those buider's bag which can hold a ton of sand or other building material can only hold about half a cubic meter of wood. So, I needed 4 cubic meters of wood to keep warm for 8 weeks but, it has been very cold. To grow my own timber sustainably, I would need to own about 1ha (one hectare) which is rougly two and a half acres of land and plant trees for a year's supply. I have learnt quite a lot about burning wood, stacking up the fire at night with huge logs was a big mistake as the wood doesn't burn properly and is largely wasted, quite apart from creating pollution. Wood is carbon neutral and is clean if burnt properly. I have found a website which I think is the most useful resource of information I have found so far: Cosi I have a Jetmaster fire which is quite efficient for an open fire (50 per cent). I have been researching with a view as to whether to buy a wood stove - they are more efficient than an open fire and can be used for cooking. Aparently to use wood to also heat water is difficult as a simple water jacket lowers the temperature of the gasses to the point where the wood is not burnt efficently and tar and pollution is increased. For a really good review of all the issues I think the link I have included above is excellent. There are of course many local suppliers. Our rubbish was not collected when it should be, last fortnight. I had to phone Wiltshire County Council to get it collected. This has confused residents, but apparently, has also confused Wiltshire County Council refuse collection who have not collected rubbish on the day when it is due, today: Tuesday 10th March 2009 (every other Tuesday). If the council can't even understand when they should collect rubbish then what hope is there for the rest of us - who might not have the benefit of Microsoft's Outlook Calendar to regulate their activities? Airsprung Beds Cafe to close - Now open again! Until recently I wasn't aware of the Airsprung Cafe in Trowbridge. The cafe serves employees and is also open to the public. One might think that a works canteen might not be able to produce good food but if only I had known about this cafe earlier. The cafe is bright and clean, the staff are friendly and the food is remarkable. It is obvious that Airsprung are subsidising the meals as one pays about half what one would have to pay elsewhere. Twenty-two pence for a cup of tea and two pounds for fish and chips! The canal road area of Trowbridge is a bit of a wilderness in terms of catering for local workers and the public. 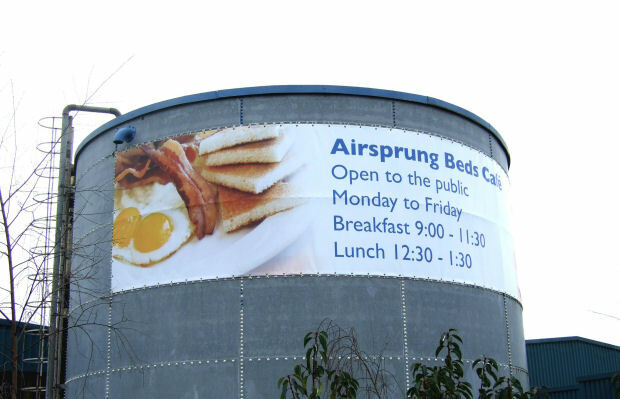 When Airsprung decided to allow the public to use their canteen they were thinking that they had spare capacity and there are workers in the area who have no place to buy a meal. I hope that more people will use the cafe and it will remain open. It's possible to get to the cafe by walking along the canal from Bradford. Another option is to do some shopping at Lidl either after a breakfast at Airsprung or after lunch. A few days of snow and we are low on salt for gritting the roads. Our own supplies of salt used to be plentiful. But salt deposits are probably not growing and we mine it just as we mine for fossil fuel. But it can be produced by evaporation so we are unlikely to really run out. I understand that although many people consume too much salt in their diet I don't think I do as I eat very little "manufactured" food, preferring to eat fresh vegetables and fruit. There is a danger that some people may be lacking salt in their diet because of well publicized advice on the danger of consuming too much salt. A similar argument could be made for those who are not eating enough fat. Often I make two cups of tea from a tea bag and then drink both cups. Often I leave too Long between cups and the tea bag is cold, too cold to make a decent cup. I have found that if I place my cup with tea bag in the microwave oven and give it 20 seconds or so on full power the second cup of tea is very good. The technique works for the third cup as well. The fourth cup is much milder! If you subject your tea bag to 1 - 2 minutes on full power you could then store your used, but now dry tea bags in a jar for later use. Most of the caffeine is contained in the first pot so sharing a tea bag is probably better for you.